Sujithra Jayaraj, MD, is a board-certified obstetrician and gynecologist dedicated to addressing the unique healthcare needs of women. She joined the medical staff at MedStar Montgomery Medical Center in 2013. Prior to MedStar Montgomery, Dr. Jayaraj was an attending physician with Medical Faculty Associates at George Washington University and, before this, practiced with Mark S. Seigel, LLC. 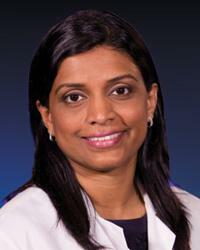 She specializes in the use of minimally invasive procedures for treating gynecologic disorders. Dr. Jayaraj earned her medical degree at Stanley Medical College in Chennai, India and completed her residency in Obstetrics and Gynecology at Wayne State University/North Oakland Medical Centers in Pontiac, Michigan. She is a Diplomate of the American Board of Obstetrics and Gynecology and is fluent in English, Hindi, Tamil and Telugu.